This model fulfills requests for a Musashi 1060 series katana with MoroHa Zukuri blade geometry. Nimble and visually pleasing, the MoroHa Zukuri blade design is unusual in having multiple blood grooves (fullers) and a back edge on the top half of the blade. Both blood grooves begin at the base of the blade. One is of normal depth and stops roughly 1/3 up the blade, while the other is narrow and extends the length of the blade. The partial back edge is purposefully left unsharpened so that the sword may be used by Iaido practitioners. It is possible to hone the back edge to a fine sharpness. Handmade, the blade hamon is formed by the clay temper process during production. The blade is differentially hardened and comes extremely sharp. This sword is well balanced and the tight handle wrap feels great. Comes complete with a black cotton storage bag and Musashi retail box. Ordered this Saturday - it arrived Monday Morning. FedEx and TS don't mess around. ;-) I cannot adequately describe how impressed I am with this sword. It is not my first Musashi (I also have the Midnight Kame - which is also a great sword), but it might be my new favorite. Because of the blade style, it is a bit lighter than my other swords. It almost feels more like a wakizashi. It was absolutely tight fitting, not a single rattle or loose piece. The blade is beautiful. It came wrapped in a protective plastic sleeve inside the saya and needed to be wiped down. Once cleaned up, the blade had a near mirror finish with a noticeable hamon line - absolutely gorgeous! The Tsuba and Kashira are also really well done. The pictures here do not do them full justice. I did a few test cuts and the blade was very sharp. It went through several items like they were not there. With the lightness of the blade and the sturdy construction of the entire sword, I could not be happier with my purchase. It ships in a fairly sturdy cardboard display box with colorful Musashi logos on it. Inside the box were three Styrofoam spacers holding the sword in place. The sword was in a standard black sword bag. It also contained a Musashi Silver Series Certificate which provided all the details on its construction. The sword was given a name but until I can translate the characters, I will call it Black Beauty. I bought this because of the blade style. I wanted something different for my collection and the Moroha-Zukuri is very interesting. I don't think you could go wrong adding this to your collection. It would also make a good first sword - but it just might spoil you for others. ;-) Go ahead, click that add to cart button and in a few days you will know the joy of owning one of these. Just got my shipment today and I am beyond impressed! The shipping was quick and the Sword is amazing quality, Razor sharp out of the box. Much nicer in person, the pictures on true swords don't do it justice, clean and wonderful paint job again nicer than in the picture. Amazing I will be buying more Musashi Katanas and ordering from true swords. Best selection online I've found! I was in love as soon as i picked up this sword, the quality is beyond anything ive ever seen, and the most important thing? its sharp as a razor! be careful running your finger on the blade it will cut you, its that sharp. i do a full video review and cut test on some bottles. watch my video to get an idea how great it is! This sword is great! I dont know if I could say enough about how great it is. It is lighter than my other katanas and very strong with a very sharp edge. By the way the hamon is real. If I could give it a higher rating I would. Trueswords will have a new life long costumer! Phenomenal. This sword is absolutely phenomenal. The temper is light and almost completely invisible, the brass that remains unpainted is polished and shines like a dull gold. The reverse edge is dull (as listed) but could still do some impressive damage on it's own. What is the most amazing thing about this product is how light it is. as mentioned in another review it is almost like wielding a wakizashi. This is mainly caused by the distribution of the steel to make the double edged effect as well as the two grooves. Very unique sword, it was the reason i bought it in the first place. Beautiful blade, the hamon is very light but you can defiantly see it in the right angle in the light. It only appears to be on one side of the blade though. The tsuba is very catchy, but seemed to have a some what sloppy paint job with it overlapping onto the edge. I was able to scrape off the overlapping paint with a penny though, so not a big deal. Overall happy with this sword, price, and quality. Overall the sword is amazing. Blade is slightly scuffed and not incredibly sharp. I actually prefer to hone the edge to razor. Love the uniqueness. It matches my style. The unsharpened back edge is a great parry tool. The double blood groove makes the sweetest sound. 4 out of 5 only because of the slight scuffing from sharpening. I was a bit nervous about choosing this sword, given that it is the 'oddball' of Musashi's 1060 series. But fear not, there's nothing remotely awkward about this sword in either the functional or aesthetic department. I would actually go so far to say it actually much more easy to wield as well as more interesting than a regular katana...which leads me to ponder why I am the first one to review this remarkable item. I received this sword right on Christmas eve thanks to the fast shipping...made a wonderful gift. As with most Musashi swords, the Katana looks even more stunning in person than it does in the product photo. It has a beautiful real hamon that is most prominent when you reflect it in the light at the right angle, it is otherwise rather subtle. The blade fits PERFECTLY into the saya, easily is pushed out by the thumb, but wont fall out of the blade if you tilt the sword downward while it is sheathed. Beautiful black lacquer finish. It seems a lot of people complain that the ito wrap is 'shoelacy' in texture, but I really don't mind it, considering I've been using an old katana without any wrap whatsoever for the longest time. It's tight, firm, comfortable, and hasn't come lose after some vigorous swinging and training with it (against the air of course...I don't even want to risk damaging this treasure of a sword by cutting through anything, not even milk jugs.) The sword came well oiled, with no defects at all in which to mention of. Even though this is the first 1060 katana I've owned, I can guarantee this is the lightest sword from the 1060 line, thanks to the double bo-hi lightening some serious mass off the blade. By far, it is the most agile and light weight sword of this length I've wielded in my entire life, and I've owned many swords. You can swing it with much more finesse than a traditional katana, and endure twice as long before you fatigue...it can be easily wielded in one hand, given that aspect. I definitely recommend this to people of smaller physical stature, or those lacking in strength â€“ this thing is as light as a feather â€“ I can't stress that enough. That doesn't mean you can't enjoy it if you are of larger statue and physical strength, for it will amaze you just how quickly you can slash and cut with this sword. As the product information states, the back edge isn't sharpened, which doesn't really matter. 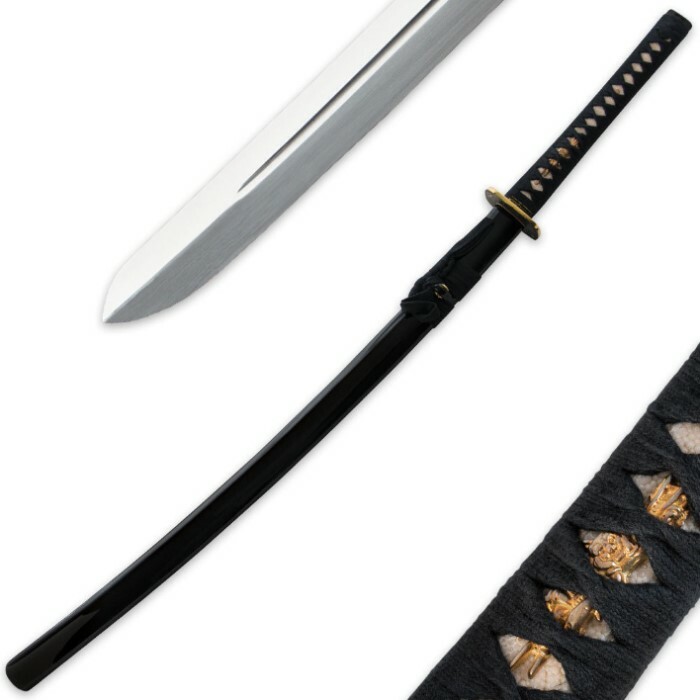 Most people are going to purchase this using the same forms and techniques as they would a traditional katana, using the spine of the blade to parry, ect. They are going to be more allured by the overall finesse of the weapon, as well as it's unique design. It's something you should get if you want something different than a traditional katana. But don't feel that you are being intrepid about buying it...it may look a bit strange at first, but it's really quite beautiful...definitely unique, and something that catches people's attention that are familiar with katanas. I also love the artwork on the tsuba (guard) and fuchi kashira (end cap). The fuchi kashira is as it is presented, with the iconic samurai complimenting the tsuba. I do imagine however, that people are confused about the artwork on the tsuba as I was. At first, we can vaguely distinguish warriors engaged in some sort of clash...let me get into that with a separate paragraph. The product picture has the tsuba actually positioned upside down. It's difficult to see on the photo, but there are actually 2 unarmored samurai fighting against one armored samurai warrior on the tsuba. I don't recommend doing this if you don't have a laptop, but if you tilt the screen upside down, you can see what I'm talking about. Two warriors on the left, one on the right if you have it upside down. Of course, if you have the real sword right in front of you, they are properly positioned where they are supposed to be. One of the unarmored warriors is using a naginata, his comrade wields a katana and they are fighting a samurai with full yoroi. Now I'm sure you're all wondering what's on the other side. It came as a surprise. It was a rather peaceful and picturesque scene...like something you'd expect to see on either a completely different katana tsuba, or perhaps on a Japanese painting. Mt Fuji is the most salient icon of this side of the tsuba, which is beautiful enough by itself, but I can also see faint outlines of the valley and the small rivers within it in which the mountain is situated in. There are also two little quaint birds nestling in some grass near one of the little rivers towards the bottom left corner of the tsuba. I can also make out some detail of the clouds behind Mt. Fuji. So, for anyone who isn't fond of the samurai's engaged in combat on the tsuba, the other side has a more serene and reflective motif for you to enjoy with this classy sword. I happen to love both images... it gives you a myriad of things to enjoy about this katana. I haven't found any real cons in this sword...just a minor preference-based issue that isn't really a 'issue' whatsoever. Anyway, my 'problem' is that I assumed from the product picture alone that the tsuba was much bigger than what it was actually was. It's one of the features that drew me towards this sword, because I've recently had problems with smaller tsubas with hollowed out sharpened edges in them. While this one isn't as large as I thought, it's no big deal. This sword actually 'seems' pretty small overall, but that's just my mind fooling me. I keep thinking I'm wielding a Wakizashi because of this. Yet of course, it is as long as a standard katana, I've measured it...I just feel stupefied sometimes because it is indeed as long as a katana should be, yet wielded like a smaller, lighter blade, almost like a machete. So, other than that insignificant issue of the tsuba not being as large as I expected, there's absolutely NO cons I found in the sword... this katana is worth much more than it is being sold for, as are the rest of the 1060 Musashi blades, I am sure. 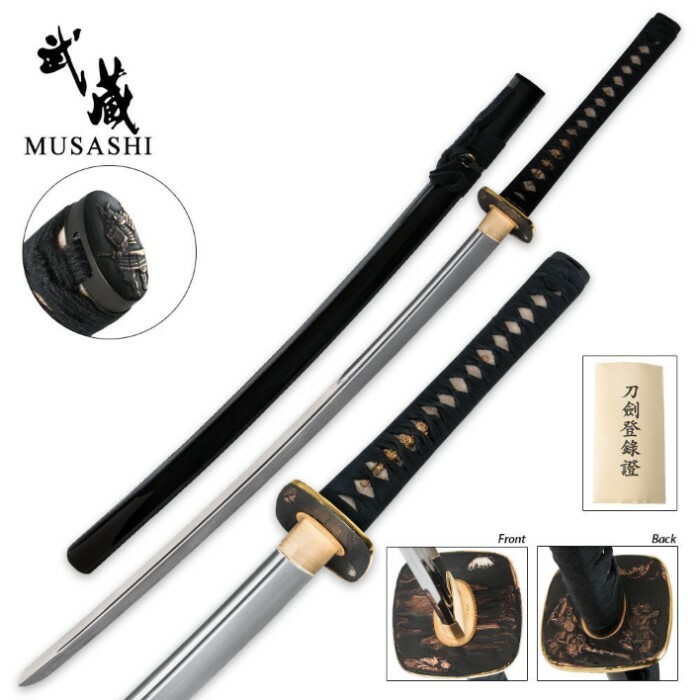 Don't hesitate to buy this blade....and do NOT chose any other sword within this price range in place of a Musashi 1060...you will not get your money's worth. And as always... purchase it from Trueswords. Not only do they offer the cheapest price and faster shipping...but their customer service is outstanding...I only have this sword thanks to their outstanding compassion to replace a sword I wasn't happy with. Thank you so much for the katana Trueswords. I will cherish this unique and beautiful sword for a lifetime.